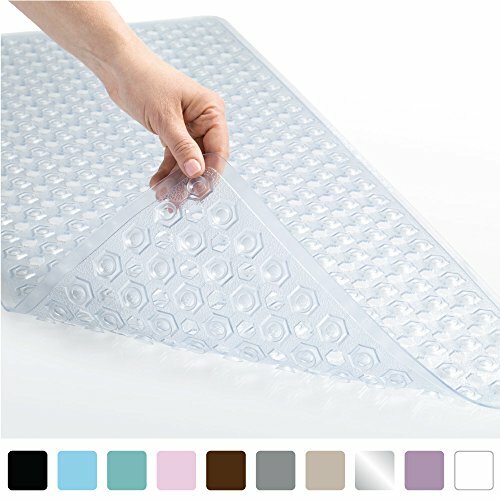 CAN I USE THIS ON MY TILED OR TEXTURED TUB/FLOOR? Unfortunately, no. Before Buying - Check tub surface. FOR SMOOTH SURFACES ONLY. Not for textured or tiled surfaces - Suction cups will not attach to uneven surfaces. MY LAST BATH MAT TURNED YELLOW? Do you have well water? Iron in well water can occasionally turn bath mats yellow. Otherwise, your mat should remain exactly like the color you purchased it. Either way, if you ever have an issue, please contact us directly. CAN I REALLY PUT THIS IN THE WASHING MACHINE? Yes, you can. Simply throw in your washing machine on cold with gentle detergent (no bleach). Air dry. WHAT IS YOUR GUARANTEE POLICY? We have a 10 year no questions asked return policy. If you are not happy with our bath or shower mat for any reason, we will provide you with your choice of a replacement or a full refund. You ask and we shall return!!! Please contact us directly if the Amazon system will not allow you to return past 30 days. !WARNING: Prevent Falls: Secure suction cups before each use. Mat will only attach to clean, smooth surface. Not for use on textured, tiled, or non-smooth surfaces. Do not use bath oils - may cause slipping.